What Should be Part of My Branding Repository? Consistent messaging. First, define your personality. Specify the services you offer, the demographic of your target audience, what differentiates your company and what matters to you as a professional. Being as specific as possible enables you to create messaging that resonates with and engages prospects, clients and industry colleagues. Remember, though, people buy a service based on the benefits of the service, not because of the service. Consistent and clear communications that place the consumers’ needs first will keep you top of mind and build brand loyalty. Promote the Industry, Promote Yourself! Lawn care technician, owner – who’s picky about a title? Lara Moffat of LM Creative Consulting, and she explains why in this preview for “Promote the industry, promote yourself!” her Learning Lounge talk at GIE+Expo. For many companies, it is almost time for midyear reviews. Spring is behind them and they are preparing for the summer. As they are reviewing their financials, it also time for them to take a look at their overall brand and assess their marketing strategies. When was the last time you evaluated your brand, and were you successful in aligning it with your business model? Simply, branding is how you and your business are viewed in the market place. Though it is not simple! It takes a process to create, time to develop, and—the big one—CONSISTENCY to endure. Branding is also not just a marketing concept, it plays a part in how every aspect of your business is communicated and perceived. The saying may be cliché, but “Perception is Reality” in the eyes of the consumer, and you want to be perceived favorably. Think of all the contact you have with your team, clients, and community at large … how are you and your business viewed? 1- What core services or products do we offer? 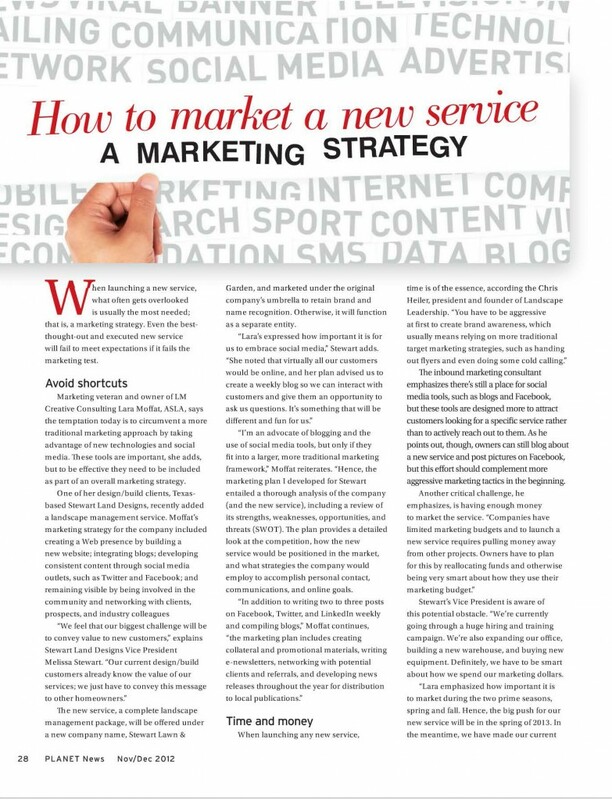 2- Are we servicing what our market wants? 3- Do we need to modify our business model? 4- How are we perceived by our employees, clients, competition, and prospects? 5- Do our team members have a clear understanding of their roles in our overall success? By answering these questions you will be on your way to clearly specifying your services, identifying your market, and differentiating your company, which will help determine how to manage your brand. Use the following to further define your branding and start developing a plan. State what services or products you offer. The more specific you are about the services or products you offer, the more likely you will be to communicate accurate messaging to your community at large, including internally to your team and externally to your customers, industry colleagues, and prospects. If you are routinely contacted by consumers regarding services you do not offer, then it is definitely time to review what message your employees, your promotional materials, and others are sending to prospects. Determine what motivates the decision makers in your key market. Knowing your target audience is essential to market to any given audience effectively, so you need to identify the consumer behavior that motivates your specific group. Consumer behavior is the study of when, why, how, and where people do or do not buy a product or service. 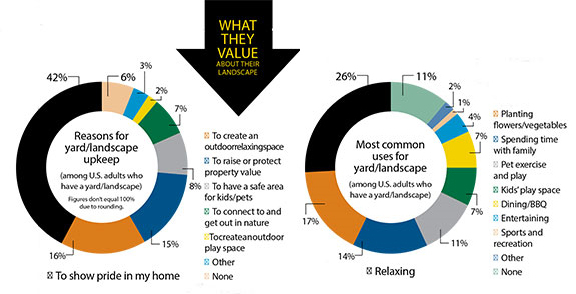 This information will vary greatly from residential to commercial and tree sales to high-end landscape construction projects. In addition, it is important to note that people really don’t buy a service because of the service; they buy it based on the benefits of the service. Promote what differentiates your company from another. 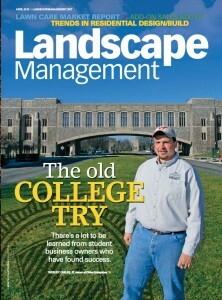 At first blush, many landscape companies offer the same services from the consumer’s perspective. But, as stated above, your client is more concerned about the benefit they receive than with the service. Try to define a personality, such as a clients’ lifestyle, a company’s involvement within the community, or a business’ sustainable practices, that authentically speaks to your target audience, business model, and community culture. Once you’ve “defined a personality,” it is time to manage your brand. Develop a plan that reviews and integrates all contacts your business has with your marketplace: employees, clients, industry colleagues, collateral, marketing, equipment, etc. Every impression makes an impact on branding, and professionalism tops the list as the way to build a positive brand. Think about the individuals you respect. I’d wager you have a high regard for them because they are a professional in their words, actions, and appearance. The same is true for your business. Train your employees to be professional by valuing what they do and that investment will have a high rate of return. By engaging your employees and making them aware of the business direction, you will build ownership and develop a team mentality. Set expectations: first, through leading by example, and second, by holding yourself accountable. Put in place tools and guidelines that enable all to achieve. Then, expect attention to detail, from the cleanliness of the fleet, to the consistency of marketing materials, acknowledging the successes and constructively course correcting the misses. Each year, devise a focus. Work with your entire team, senior management through crewmembers, in the initial year, and lead exercises that give them the basis to communicate your brand. Start with a concise and clear mission statement or tagline—a succinct version of an elevator speech. Ensure everyone understands it and lives it. Remind them of the message in speech, in conduct, and print. Share it in conversations with clients, networking with colleagues, releases to the media, and in your promotional collateral. By embodying and embracing your brand, your company will be hard to miss in the marketplace! In April, I led a PLANET webinar titled “How to Define and Manage Your Brand” that covers this topic in more depth. 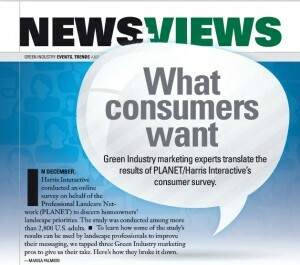 After reading this article, and if you are interested in learning more, then I recommend reviewing the presentation online in the webinar archives which can be accessed at LandcareNetwork.org and following the instruction on the Webinars page under the Events/Education tab. Lara Moffat, owner of LM Creative Consulting and former director of marketing for a nationally recognized Design/Build/Maintenance firm, brings a diverse educational background (degrees in art, psychology, horticulture, and landscape architecture) and a wealth of landscape industry experience to her approach to strategic marketing, public relations, and branding that’s ideal for any size business. Moffat understands how to market to clients desiring a luxury good as well as those requesting a service product. Through her strategic process, she can help you analyze your business, develop a tailored marketing plan, and align an integral message, both internally and externally, with your overall business plan. Press Releases: Spend the Time or A Waste of Money? To network successfully, you need to know when to surf and when to turf! You’ve just come back from an event and you have a stack of business cards now piled up on your desk. Adjacent to that pile is a mountain of paperwork that needs your attention. Do you have a system that ensures both can be addressed? I’ve heard it asked time and again, “How do I manage my network and continue to be productive with my business?” “Who has time for email, let alone social media platforms?” Actually, you do. Articles on social media currently dominate most marketing discussions and place an emphasis on the importance of being technologically savvy. What these dialogues tend to sideline is the importance of relationship building through personal interactions. To network successfully, you need to know when to surf and when to turf. As we all know, the key to successful networking lies solely in making connections. And how often you connect depends on the contact, your relationship, and the mode of communication. Understanding the way an individual likes to communicate is as vitally important as the purpose of the message. But first, you need to get to know the person. Right now, before you even finish reading this article, think of three items of interest that might be talking points when you are introduced to someone new. Introductions can be awkward, so being prepared to communicate and relate should be top of mind. Singularly, the goal of initial conversations is to find something of mutual interest, whether it is a common friend or a shared activity. When introduced, take a sincere interest in the person and ask engaging questions that spur a conversation. However, especially at events, know when to move on so as not to monopolize the person’s time to meet others. And, before saying your goodbyes, exchange business cards, and then do follow-up. Connecting via LinkedIn is one of the best and easiest ways to reach out to a new contact. Be sure to mention the meeting and refer to something specific that came up in the conversation. If you have an article that would be of interest, connect first on LinkedIn and then send an email later in the week. As previously mentioned, the way a person likes to communicate is as important as the message. Consider how you like to communicate. Do you pick up the phone or dash off an email? If a contact repeatedly answers your calls with an email or a text, then it is a safe bet that he or she prefers this mode of communication. It may be a preference based on that person’s workload or a matter of the person’s age, not necessarily an avoidance to chat. Either way, keep the message brief, professional, and clear. Try to respond to an individual’s connection as soon as possible! It may be hard to conceive; nevertheless, texting is now part of mainstream business communications. It is used to send quick responses or messages when a phone call can’t be made and is time sensitive. Again, keep texts brief and on point as with emails and social media platform messages such as LinkedIn or Facebook. Lengthy emails, phone calls, and most letters should be replied to within 24 hours depending on the response needed. If you need to address a matter with delicacy, pick up the phone or, if possible, set up a face-to-face meeting. In the green industry, we visually remain in the forefront of our clients’ eyes through the care of their landscapes. Depending on the sector you service, the attention you provide can be seen multiple times a day. Responding to your customers’ landscape needs depends on the urgency of the matter and the temperament of the client; however, someone within your company should respond the same business day. Again, respond to clients in the manner they prefer. Remember, consumers don’t buy a product based on what the product does per say; they buy because of the benefits they receive. People characteristically make purchasing decisions because of connections, whether or not they recognize it. Depending on the purchase, it can be as wide ranging as a referral to collegiate affiliation or a civic interest. But, almost always, they won’t buy from someone they don’t feel comfortable with or who doesn’t keep their interests in mind as a top priority. The same is true of those who give referrals. Electronic communication can sometimes go awry because of the absence of social cues. Misinterpretation is often cited as the No. 1 reason a relationship sours, and the result can quickly spiral out of control. Studies have shown that when we receive an email, we are more influenced by the unrelated events that happened to us prior to reading the transmission; whereas, in a face-to-face meeting or even a phone call, we disassociate ourselves more from the emotions of the day. If you find yourself either as the “misinterpreter” or “misinterpreted,” make the first move and address it immediately. Once context is established, the misinterpretation typically gets forgotten and does not impact the relationship. Knowing when to surf (to communicate digitally) or turf (call or speak in person) will help you appropriately communicate in the digital age!